of the many unique wedding gift ideas available from Clarner Woodworks. A handcrafted custom furniture item from Clarner Woodworks makes a wonderfully unique and personalized wedding or anniversary gift. Not only is our furniture handsome, but it also functional and built to last. 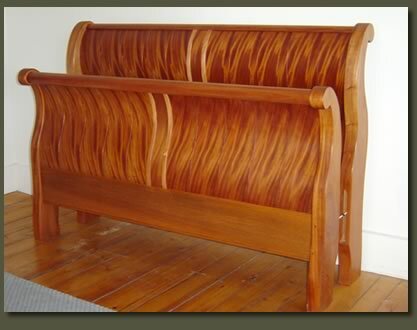 Each piece of our furniture is custom made by Vermont craftsman, Doug Clarner, who will work with you from design idea to final product to create a high-quality and enduring wedding gift that fits the couple's needs and style. 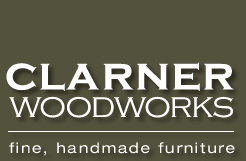 Furniture from Clarner Woodworks makes a wonderful gift from the wedding party or from the parents of the bride or groom because custom furniture is personalized in a way that few other wedding gifts can be. Bring us your idea, and we'll help make it a reality, whether you choose a completely new design or prefer to customize one of the furniture items shown on this website. Some of our most popular wedding gift ideas include the unparalleled Crowley Sleigh Bed, with its one-of-a-kind detailing, the Walnut Cross Coffee Table with its unique design and uncommon good looks, the elegant Flaming Birch Sideboard, whose unique flame birch door panels make an impression, and the Rheingold Vatwood Sideboard, a one-of-a-kind treasure made of old growth cypress reclaimed from an historic building in Brooklyn, New York. If you are searching for a personalized wedding or anniversary gift, then our new Vermont Wedding Table will make a perfect choice. 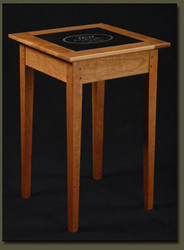 These end tables are custom made in the village of East Burke, Vermont, and demonstrate the quality craftsmanship you expect from New England furniture makers. The simple elegant design makes it a wonderfully versatile companion to any room decor, and although its unique attractiveness may encourage you to use it as a 'show piece' only, these tables are designed to be a practical and functional part of everyday living. The granite or marble used for the in-lay is as durable as it is handsome. Personalize this gift with a message -- such as the couple's names and wedding date, or the couple's wedding vows -- and your inscription will be engraved with laser-precision into the table top in accordance with your personal preferences. If you would like to give a wedding anniversary gift according to the Traditional Anniversary Gift list, don't forget that the 5th Wedding Anniversary calls for the gift of wood (the Modern Anniversary Gift list indicates wood as the appropriate gift for the 6th Wedding Anniversary.) What gift could be better for this special anniversary than the gift of fine handcrafted furniture, custom made to meet your needs and specifications? Some wonderful gift ideas include the classically elegant Bowfront Hall Table, the versatile Cherry Media Cabinet and the incredibly beautiful Cherry Dining Table, or bring your idea and vision to us, and we will work with you to design a one-of-a-kind piece of furniture.